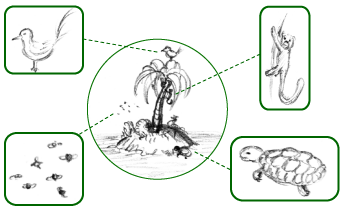 Simplified schematic of an island's fauna with all its animal species, highlighted in boxes. Fauna is all of the animals of any particular region or time period, considered as as group. The term is contrasted with flora, which refers to all of the plant life in a particular region or during a stated period of time. Fauna is also the word for a book cataloging the animals of a particular region or time period. The term was first used by Linnaeus in the title of his 1747 work Fauna Suecica. Zoologists and paleontologists may use fauna to refer to a typical collection of animals found in a specific time or place, such as the "Sonoran Desert fauna" or the "Burgess shale fauna." Various subgroups also are identified on the basis of size (such as megafauna or microfauna), taxonomic group (such as avifauna), location (such as epifauna), and so forth. Through such categorizations into subgroups, zoologists and paleontologists can look for larger patterns in nature, such as those related to extinction or reproductive strategies. Paleontologists sometimes refer to a sequence of faunal stages, which is a unit of time based on changes in the observed fossil assemblages, with a particular stage having rocks with similar fossils. The name comes from Fauna, a Roman fertility and earth goddess, the Roman god Faunus, and the related forest spirits called Fauns. All three words are cognates of the name of the Greek god Pan, and panis is the Greek equivalent of fauna. In addition to the general use of the term fauna for all the animals in a particular region or time period, modifiers are used to delineate particular subgroups of fauna. The terms macrofauna, megafauna, meiofauna, mesofauna, and microfauna differentiate animals according to size. Terms like avifauna (birds of an area or period) and ichnyofauna (fish of a particular region or time) distinguish groups based on taxonomic groups (Barrows 2000). Epifauna (total fauna living on the surface of sediments or soils) delineates a group based on a specific location, while ichnofauna (an area's animal traces) refers to fossil evidence for animals in the past (Barrows 2000). 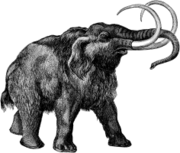 The mammoths constitute an extinct genus of megafauna. The terms microfauna, meiofauna, mesofauna, macrofauna, and megafauna are often not well-defined, confusing, and used variously by different researchers. The following is a general overview of the delineations based on size. Microfauna. Microfauna are microscopic or very small animals (usually including protozoans and very small animals such as rotifers). Burrows (2000) defines microfauna as those not visible to the unaided human eye. Meiofauna. Meiofauna are small benthic invertebrates that live in both marine and fresh water environments. The term meiofauna loosely defines a group of organisms by their size, larger than microfauna but smaller than macrofauna, rather than a taxonomic grouping. In practice, these are organisms that can pass through a one millimeter mesh but will be retained by a 45 μm mesh, but the exact dimensions will vary from researcher to researcher. Barrows (2000) defines meiofauna as "small interstitial animals that pass through a one millimeter mesh sieve but are retained by a 0.1 millimeter one." Whether an organism will pass through a one millimeter mesh will also depend upon whether it is alive or dead at the time of sorting. Mesofauna. Mesofauna are macroscopic soil invertebrates of intermediate size, such as arthropods, earthworms, mollusks, and nematodes. Macrofauna. Macrofauna are larger benthic or soil organisms, which some consider those of at least one millimeter in length, but others consider to be larger yet. Burrows (2000) defines macrofauna as larger soil organisms that can be removed readily with one's hands from a sample of the soil, and in particular burrowing vertebrates such as rabbits or moles. Barrows (2000) notes that some authorities may include larger earthworms and insects as well. Megafauna. Megafauna is be a subdivision of those animals that are considered "large." The term comes from the Greek μεγας, meaning "large," and the modern Latin fauna, meaning "animal." Definitions of what constitutes "large" vary, with some authors using a 40 kilogram minimum (DOE), others 44 kilograms (Stuart 1991), 45 kilograms (Corlett 2006), 100 kilograms (Martin and Steadman 1999), or 250 kilograms (Choquenot and Bowman 1998). In the last case, they may be further subdivided into small (250 to 500 kilograms), medium (500 to 1,000 kilograms) and large (over 1,000 kilograms) megafauna (Choquenot and Bowman 1998). Others say that any particular limit in size is arbitrary, and do not favor a single minimum weight (Wroe et al. 2004). Barrows (2000), in his reference text, simply defines megafauna as "fauna large enough to be seen with the unaided human eye," drawing a much smaller lower limit for the term. The term megafauna also is used to refer to particular groups of large animals, both to extant species and, more often, those that have become extinct in the geologically recent Quaternary period. Examples of fauna typically considered as megafauna are the Asian elephant (Elephas maximus), domestic dog (Canis familaris), donkey (Equus asinus), dromedary camel (Camelus dromedarius), pig (Sus scrofa), llama (Lama glama), sheep (Ovis aries), turkey (Melagris gallopavo), chinook salmon (Oncohynchus tshawtscha), and blue whale (Balaenoptera musculus). In the sense of large animals, many kilograms in weight, megafauna animals are generally K-strategists, with great longevity, slow population growth rates, low death rates, and few or no natural predators capable of killing adults. These characteristics make megafauna highly vulnerable to human exploitation. Some authors have argued that this reproductive capacity and ecological behavior are more important than size alone, with some much smaller animals with very low reproductive rates showing "megafauna" characteristics, such as all Tachyglossidae (echidnas) and Megatherioidea (two-toed sloths) above seven kilograms and six kilograms respectively, having become extinct in late Quaternary megafaunal extinctions (Johnson 2002). Many species of megafauna have become extinct within the last million years, and, although some biologists dispute it, human hunting is often cited as the cause (Diamond 1997). Other theories for the cause of the extinctions are climatic change associated with glaciation and the questionable hyperdisease hypothesis (Grayson and Meltzer 2003). The following are some other common subdivisions of the term fauna. Epifauna. Epifauna are the total fauna (animals) that live upon the surface of sediments or soils, such as on the surface of a seabed. Avifauna. Avifauna refers to the birds of a particular region or during a stated period of time. Ichnyofauna. Ichnyofauna (or piscifauna) refers to the fish of a particular region or time. Ichnofauna. Ichnofauna refers to an area's animal traces (Barrows 2000). Cryptofauna. Cryptofauna is that fauna of concealed or protected microhabitats (Barrows 2000). Phytalfauna. Phytalfauna is that fauna of concealed or protected plant microhabitats (Barrows 2000). Barrows, E. M. 2000. Animal Behavior Desk Reference: A Dictionary of Animal Behavior, Ecology, and Evolution, 2nd edition. Boca Raton, FL. : CRC Press. ISBN 0849320054. Choquenot, D., and D. M. J. S. Bowman. 1998. Marsupial megafauna, aborigines and the overkill hypothesis: Application of predator-prey models to the question of Pleistocene extinction in Australia. Global Ecology and Biogeography Letters 7(3): 167-180. Corlett, R. T. 2006. Megafaunal extinctions in tropical Asia Tropinet 17 (3): 1–3. Diamond, J. 1997. Guns, Germs and Steel. Vintage. ISBN 0099302780. Defense of the Earth (DOE). n.d. Past consequences of climate change: Evolutionary history of the mammals Defense of the Earth. Retrieved July 18, 2008. Grayson, D. K., and D. J. Meltzer. 2003. A requiem for North American overkill Journal of Archaeological Science 30: 585–593. Retrieved July 18, 2008. Johnson, C. N. 2002. Determinants of loss of mammal species during the Late Quaternary 'megafauna' extinctions: Life history and ecology, but not body size. Proc. Biol. Sci. 269(1506): 2221–2227. Retrieved July 18, 2008. Linnaeus, C. 1746. Fauna Suecica. Martin, P. S., and D. W. Steadman. 1999. Prehistoric extinctions on islands and continents. Pages 17-56 in R. D. E. MacPhee, ed., Extinctions in Near Time: Causes, Contexts and Consequences. New York: Kluwer/Plenum. ISBN 0306460920. Stuart, A. J. 1991. Mammalian extinctions in the Late Pleistocene of northern Eurasia and North America. Biol. Rev. 66: 453–562. Wroe, S., J. Field, R. Fullagar, and L. S. Jermiin. 2004. Megafaunal extinction in the late Quaternary and the global overkill hypothesis Alcheringa 28: 291-331. Retrieved July 18, 2008. This page was last modified on 23 July 2008, at 00:57.